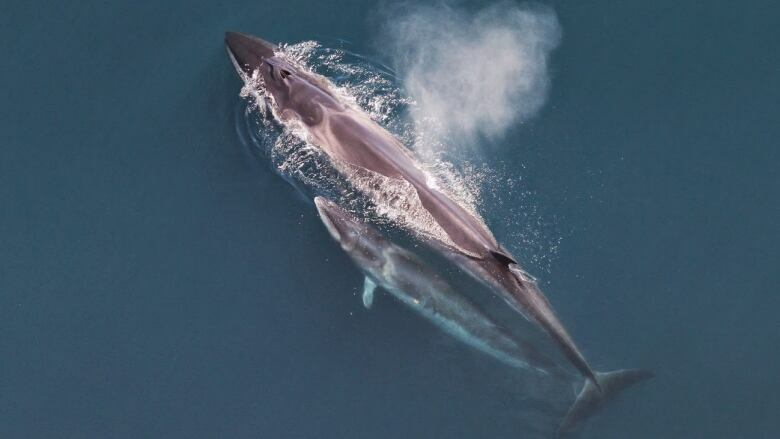 Endangered sei whales have been seen in Canadian waters for the first time in more than half a century. For a handful of researchers surveying marine life off British Columbia's coast — it was a whale of a tale. "This was very exciting because we didn't expect it," said Thomas Doniol-Valcroze, a research biologist with the Department of Fisheries and Oceans. "People on my team had never seen them." At one point, there were more than 60,000 sei whales in the North Pacific, but the population collapsed after whalers started targeting them. There hadn't been a single reported sighting of a sei whale in Canadian waters since before whaling was banned in the 1960s. A 2006 Canadian report says there were two confirmed sightings of sei whales in Pacific waters off the west coast of the United States between 1991 and 2001 but none in Canada. They are listed as endangered in Canada's Species at Risk Act. "Sei whales are so rare nobody is actually completely sure what they sound like here in the Northeast Pacific," he said. "We started hearing those sounds that sounded very similar to what sei whales were recorded doing elsewhere. We started hearing them more and more and that led us to finding them and seeing them for the first time many years." The researchers were part of a 10-week survey trying to count, or estimate, all marine mammals populations in Canada's Pacific. The survey is the first of its kind in the Pacific ever conducted by the federal government, which has done similar surveys in the Atlantic and the Arctic. However, in 2017 the United States began enacting a specific provision under its Marine Mammal Protection Act that puts the onus on countries exporting seafood to the U.S. to prove their fisheries are not harming marine mammals. The requirement meant Canada had to update its data if it wanted to continue exporting seafood to the U.S. The final results of the survey will not be published for a year, said Doniol-Valcroze, but he added it was quite successful. In addition to the sei whale sighting, the teams also found higher than anticipated numbers of harbour porpoises, he said.